New research commissioned by the Fair Tax Mark reveals that the Scottish public want to see the UK Government intervene much more robustly to encourage responsible tax planning by business. An overwhelming majority (82%) of those questioned in Scotland support a call for all companies, whatever their size, to publicly disclose the taxes that they do or don’t pay in the UK – with just 5% of the public disagreeing. Currently small businesses are not required to disclose their profits and taxes paid, and can file abridged accounts at Companies House. And when it comes to public procurement, 7 in 10 (70%) believe that the Government and local councils should consider a company’s ethics and how they pay their tax, as well as value for money and quality of service provided, when awarding contracts – with just 10% agreeing that contracts should be awarded regardless of ethics and tax conduct. Currently, tax conduct is rarely, if ever, factored into public procurement in a meaningful manner. 1 in 8 (13%) trust a company auditor to confirm that a business is paying the right amount of tax, compared to 40% trusting an independent accreditation scheme such the Fair Tax Mark and over half (51%) trusting HM Revenue and Customs (HMRC). Twice as many disagree as agree (40% vs 19%) that Government should reduce the amount of tax companies pay in order to attract foreign investment into the country to create UK jobs. The polling also found that seven in ten of the Scottish public would rather shop with a business (71%) or work for a business (73%) which can prove it’s paying its fair share of tax; and nearly two-thirds of Scots (64%) would trust a business with the Fair Tax Mark more than one without it. A majority of the public say that they would switch the businesses they use in favour of one that has the Fair Tax Mark (53%) – with just 9% disagreeing. 7 in 10 (71%) think it’s important to celebrate businesses that can demonstrate they pay the right amount of tax and who overtly shun the artificial use of tax havens and contrived tax avoidance practices. 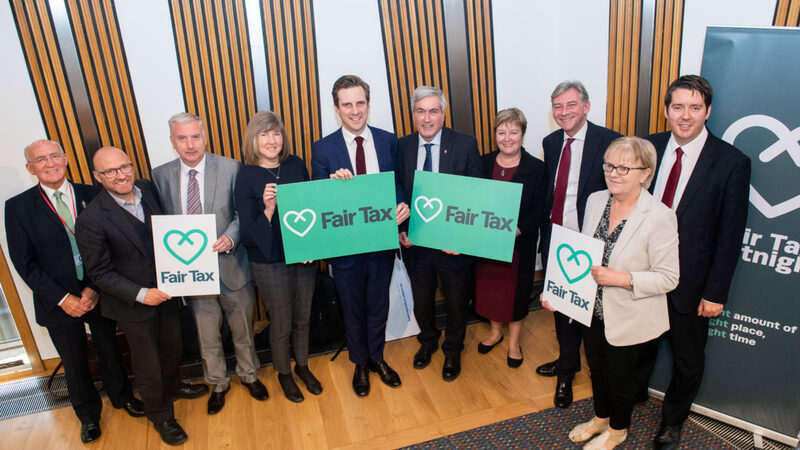 The figures have been released as part of Fair Tax Fortnight at an event in the Scottish Parliament hosted on behalf of the Scottish Co-operative Party Group of MSPs by Rhoda Grant MSP on 19th June. Scotmid President Harry Cairney said: “We actively support and promote the Fair Tax Mark and we look forward to seeing more businesses in Scotland follow suit in the future. “Fair tax matches our core purpose as a co-operative, which is to serve our communities and improve people’s everyday lives.